On Wings of Eagles: A broken branch and God's protection. 29 Are not two sparrows sold for a penny? And not one of them will fall to the ground apart from your Father. 30 But even the hairs of your head are all numbered. 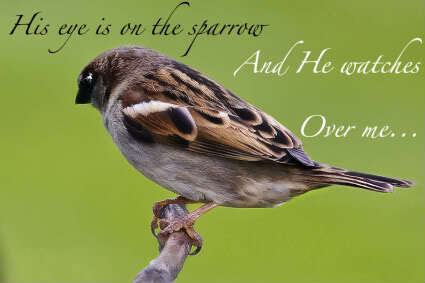 31 Fear not, therefore; you are of more value than many sparrows. About five years ago, Lisa, her husband Dave and their two children were doing some Sunday yard work. Dave was trimming tree limbs that were starting to hang over the roof. He was on the extension ladder, holding the chain saw, and Lisa was standing on the bottom rung to steady it. The children were dragging the small branches and debris to the street. Dave was cutting a good sized limb from a Black Oak tree, a very heavy and hard wood. “We had done this a hundred times,” Lisa says, “and Dave knew what he was doing. Each time he cut a limb, he would make a half pass through it, then cut another pass, and the branch would fall away from us, and land in the front of the house.” As she says, they had done it frequently. Lisa turned her head and lifted her hand palm up, even with her shoulder. Casually she caught the large branch one-handed! Her arm recoiled, but she held on and tossed it easily to the side. Shaken, Dave scampered down the ladder. "Are you all right, are you all right?" He kept shouting. The kids were horrified. But Lisa assured everyone that she was fine, and brushed the dirt and loose bark splinters from her forearm and shoulder. “My arm stung a bit from the abrasions, but I was really OK and very calm,” she says. "Let's move this thing to the side," she said to Dave, "and call it quits for today". Still somewhat stunned, Dave grabbed a section of the limb to lift it, while Lisa took hold of a portion on her side. Shocked, their eyes met. They couldn’t budge it. The limb was unbelievably heavy. Later, when the children volunteered to help, the four of them could only drag it an inch or so at a time. Lisa has never forgotten that moment. She knows she does not walk through life alone. No matter what the adversity, God will see her through. Dear Lord, thank You for taking care of us in ways that we don’t even know or understand. Help us to always trust You in all of life’s circumstances. In Jesus’ Name, Amen.